We recently experienced a great visitation of God’s presence as we ministered in a Hispanic Church down in the border area, which tied in with a recent experience up in the mountains where the Lord spoke through a series of circumstances. It felt like a really unique time when I was preaching as I noticed an incredible leading of the Spirit taking place with the message: The subject was on discipleship and God’s work in our lives to form us into disciples—not just converts—as we walk with and serve the Lord. There was an unusual attentiveness there as I spoke that I hadn’t experienced with this congregation before, and a very powerful outpouring of the Holy Spirit afterwards accompanied by some powerful healing. With all our trials and tribulations as believers we must keep our eyes on the prize—being formed into Christ’s disciples is His plan—all the things we endure, we sometimes forget, are working to our benefit so that God’s grace can reach more and more people (2 Cor. 4:15) and cause praise to flow to God. While in the middle of various ministry we noticed we were coming near the end of summer fast; after ministering in Canada in the beginning of summer and being on the road for weeks at a time, and then getting caught up in various ministry once back here, the days of summer had just zipped by and were almost gone, it seemed, in the blink of an eye. We decided we should take advantage of an invitation to head up to the Sierras right before summer ended and do a backpacking trip with our friend Lauren, as well as meet up with other friends up in the Sierra Nevada Mountains for a little biking afterward. Sometimes you do things and you start getting a sense that the Lord has something more planned than you were aware of. This was one of those times, as we were blown away how the Lord was going before us and literally setting things up for our venture right from the beginning. We showed up at our friend’s place to find out that a couple she knew happened to be renting a cabin for that weekend right by the trailhead we’d be taking. They invited us all up to come and spend the night there to begin our journey the next day from the cabin. It couldn’t have worked out better if you planned this six months in advance. It was clear the Lord was setting things up and going before us. What we didn’t know yet were all the divine appointments he had planned, including a major one as we crossed the threshold into the cabin. We finally arrived at the cabin late in the evening after just having driven up that day, and as we literally walked in through the door, one of the young ladies visiting there said that she’d like us to pray for her since she had to leave shortly. Before we knew it, we had just barely walked through the door and then extended our hand to pray and the Spirit of God was falling in power all around us—literally. The next thing we knew we were in the middle of a move of God and everyone there at the cabin was getting hammered by God’s presence. We had a radical unexpected move of God straight away that evening; it was mind blowing the way the Lord just fell so powerfully right as we walked in the door! The next morning we came to find out that one of the guys we were staying with was an experienced backpacker who was able to give us some much needed tips and advice for our trip before we headed out. We were equally amazed to find out that we would be able to literally start our hike straight from the cabin since there was a trail right there that connected to where we were going, and also leave our car right there with them; none of this was planned by us, however by God’s grace it just “all fell into place”. We were blown away how the Lord orchestrated everything and also glad that we would not have to park the car out in the middle of nowhere by the trailhead like we thought we were going to have to do. We hit the trail rejoicing in all that God had done. We were having a great hike, excited that God’s hand was with us every step of the way, including another divine appointment right away as we got going along the trail, running into an acquaintance from San Diego. Well into the hike later that day, while enjoying the views as we walked up the trail, out of left field suddenly came the unexpected. Altitude sickness came upon me as subtly as a falling piano once we got over 10,000 feet elevation—having driven straight up the day before from sea level, we never had a chance to acclimate. With one-third less oxygen in the air at that elevation, I suddenly began to experience a splitting headache that got worse with every step. It felt like someone had put a bell over my head and was banging it with a sledgehammer. Waves of nausea then began to hit me as I continued to hike. The situation was complicated by the fact that we needed to get to our destination before dark to set up our tent, and we were only about 3 miles into the 6 miles we needed to go. The altitude sickness only kept getting worse, even though we stopped to rest to try and let it subside. It got to the point where I felt like I couldn’t go on any further. I became aware of how similar this was to the feeling that can overwhelm you on the mission field when the warfare hits you like a ton of bricks. The reason some may never experience warfare in their Christian walk is because they never do anything that is an any way threatening to the kingdom of darkness or in the least way pursuing the purposes of the Kingdom of God or stepping out to evangelize the lost. Some believers also discount the enemy and his realm and that is exactly how Satan likes it; he can be most effective if believers think he is not there and then can all the more deftly carry out his evil schemes. Well, back to the story, this hike was causing everything in my physical system to be ringing louder. The altitude sickness kept getting worse as we went higher; all I could do was cry out to God for help—and for a while that seemed to do no good—but somehow I just kept pushing on. At one point I began to worship the Lord out loud, even though it was the last thing I felt like doing, since every effort and movement took all my strength. However, at that point, God’s presence began to fill me and the sickness began to subside some, and a bit of strength came back. It is hard enough to keep going uphill higher and higher in altitude when it is making you sicker and sicker. Carrying a thirty-pound backpack certainly doesn’t help matters either. Nevertheless, as I worshipped the Lord I could feel strength coming into my body and it was clear it was supernatural and not my own. So after walking with new strength and feeling somewhat better for a bit—I still had a bit of ringing in my head—we came to a junction. As we looked out ahead, we could see an emerald green lake down in the distance to our right that looked so enticing, especially since it was downhill from where we were. And yet as we paused to pray about which way we should go, we all kept getting a feeling from the Lord that we were to instead turn left and go uphill at this juncture. This was neither attractive nor made sense to the natural mind, since going left looked really daunting and we could see no destination, and looking right in the other direction we could see a nice lake in the distance, and yet we stepped out in faith and went left, and it was pretty much straight up with heavy switchbacks, causing us to question if this could be the right thing we were doing. This boggled the natural mind to be sure; however, it was one of those “lean-not-on-your-own-understanding” moments, and since the same word kept coming to go left, we began to head up. I was not a happy camper as the head ringing came back when I started to make my way up the heavy switchbacks. Finally, we got up that last steep and gnarly hill, which just happened to be the heaviest one of the whole entire hike. So after 6 long miles uphill that day with a thirty-pound backpack and somewhere in the vicinity of 1500 feet of elevation gained, we ended up at a picturesque little heavenly-looking lake with a perfect little patch of grass right by the water’s edge where we could set up camp for the night. 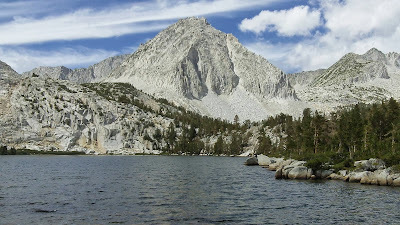 Final destination: the little lake we camped by in the Sierras at 11,000+ feet. It was a rare moment in life to be somewhere so isolated, free from all the normal noise and other pollutions and interruptions of our everyday urban world. We took it in and were glad we had persevered, something so neccessary to get to this once-in-a-lifetime spot. We had an awesome time there, even though we were a little cramped as we squeezed all four of us into a tiny little backpacking tent that was really only suited for 2 people. I was glad that I had persevered through the trial of the severe altitude sickness. Perseverance is something not emphasized much these days with all the “instants” of our modern society. From expecting instant food without a moment’s waiting to instant success in any endeavor taken on, most people, including believers, do not have a paradigm for understanding the importance of persevering and enduring trial and difficulty, nor do they think it is something they might have to go through, thinking that if they do endure trials then something must be completely wrong. We’ve been so completely and absolutely wrongly conditioned and, yes, even taught, to expect our “best life now” without any suffering or trial or battle involved at all. Nevertheless, we find something altogether different in the pages of the Bible: well over one-third of the Psalms are laments, including many by David who was chased like a dog and lived as a refugee while waiting for God’s promise and prophecy to be fulfilled for his life. Paul the Apostle talked at length in a personal way about his own trials, difficulties, and tribulations in serving the Lord on the mission field, and cautioned that those who serve God will experience them too. And lest we forget, Jesus, the very Son of God, yes, God the Son, had no place to lay His head and died on a cruel cross for our sins, not all endless fun and frolicking there. Famed missionary of the 20th century to the Motilone Indians Bruce "Bruchko" Olson suffered one trial after another for years in the jungles of Colombia before seeing one single convert. Without perseverance he wouldn't have reached them at all like he did. Likewise, William Carey, known as the Father of Modern Missions, labored and suffered in India for more than five years before seeing a single convert. On and on throughout Christian History we see the same pattern present itself. Even though blessings upon blessings are given to us by the Almighty, they are not without the accompanying trial and tribulation that buffet those who seek to truly and fully follow the truth! Well, we returned from our hike up the mountain back to civilization—it is always easier coming back down for some reason—to more divine appointments. We prayed for a young lady whom we met who had been struggling with that discipleship process, and as we talked with her before dinner, tears fell from her face as the Holy Spirit came upon her as she realized the time had come to lay her life fully before Christ and take up the cross and follow him completely!!! Glory! Then, when we visited a mountain church on Sunday, the Pastor talked all about not relying on the natural mind but on the Spirit’s leading—exactly what we had just experienced on our backpacking trip! Then this pastor, a man whom I had never met before, walked up to me at the end of the service and said, “What about you, do you have a word to share? Wow, that was some faith and discernment on his part! I shared a word and began to pray over the congregation and God’s Spirit moved and was poured out and we ended up ministering over quite a few different people with the Lord’s presence being poured out that day. We talked later with the Pastor and found out we had many things in common and he thanked us for helping him “to land the message” as he wasn’t sure how to segue into the ministry, but the word I shared and the ministry that flowed from that point was exactly what was needed, he told us—Glory!!! You can bet we’ve had many experiences on the mission field where we needed to persevere through many trials, from being stuck with nothing but a can of sardines over a few day's journey on a train, to having to fit three people in a tiny little cot to sleep in the middle of a freezing cold winter in Sweden. We often have to first persevere through difficulty to get to the glory parts; if you only ever share about the glory, others who will step out may think it strange when they start experiencing trials also. Well, I will share a little more on some of those stories later, but in the meantime watch this video from our friend Erik, who experienced some hard times early on, on the mission field with us!!! We appreciate your prayers and financial support, it not only helps us to do the work of a disciple, but also call others unto radical discipleship of Christ as well! !